Advertisers can now monitor how campaigns are performing against performance targets in the Bing Ads Interface. 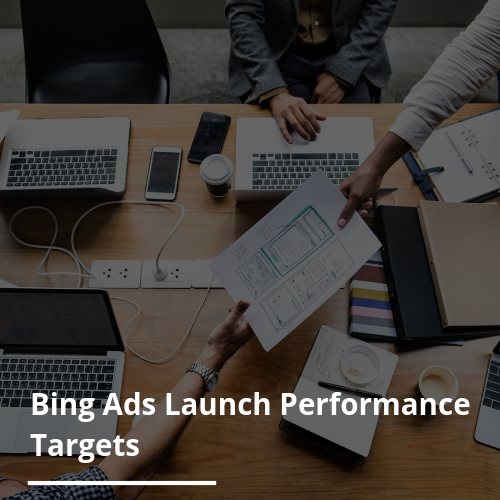 Bing Ads has introduced a new AI-powered tool designed to let advertisers set and track performance targets on campaign groupings in a new dashboard. Understand how each of your campaigns are contributing to performance targets. See an overview of performance targets history and period-over-period trends. Evaluate whether you are on track by comparing targets to actual and forecast performance trends. View a prediction of campaign performance towards those targets. Implement weekly or monthly targets for spend, clicks, and CPC for specific groups of campaigns. Performance Targets link → Click “Create Performance Target” → Enter a name for the Performance Target → Select a group of campaigns to monitor → Choose a time period → Create metrics to track. Do you feel you miss the latest Bing Ads updates and feature releases? If so, then contact Mabo today to see how your PPC advertising could benefit from working with our team of PPC management specialists.